There’s something to be said for films that explain with their very title the entire premise of the film that follows (yet somehow still manage to provide misleading information regarding final narrative resolution). What is described as “a missile the size of the Chrysler building”, is a supposedly “unstoppable” runaway train. This is the beginning and the end of what constitutes “plot” in Tony Scott’s latest high-octane action/thriller Unstoppable (2010). The opening credits combine atmospheric framing of large freight trains and slowed camera work to infer stilted time. Here, it is made clear that temporality in Unstoppable will be subject to both ellipsis and screen-time manipulation. This is probably the film’s most disappointing undoing. Trains, and “railway time”; being the literal vehicle through which the Victorians actually set social order with regard to standardising time across Britain; it is a great loss to see a film whose subject matter is primarily concerned with a race-against-the-clock premise, fail to make effective use of temporal tension. A “real-time”, or even just a better defined screen-time, explanation of the gathering momentum of the runaway train might have afforded the film with tighter, and therefore more gripping, parameters. Whilst there is some indication that “age” and “time” are significant, illustrated through the contrasting of the “old timers” who work at the rail yard and the fresh out of training enthusiastic but wet behind the ears kids, the contrast fails to achieve much beyond a nod to existence. Similarly, a group of small school children about to enjoy a train journey scream out in unison, “What time is train time?! !” and yet, again, this is far as the inference goes. Ultimately, each time the film indicates or alludes to the importance of time it fails to operate as anything beyond acknowledgement. Subsequently, the film is very much lacking in interesting subtext and insofar as theoretical content is concerned, the film is entirely empty. That said, there is definitely a superficial thread that is concerned with the way in which automated operating systems and corporate moguls pose a considerable danger to a physically laborious profession. This is well illustrated through juxtaposing incompetent characters against the proverbial old-timers whose years of experience and good old-fashioned know-how is the only thing that can possibly slow and stop the train. Under-appreciated and facing redundancy, the old-timers prove to be the backbone of the industry and, working with a new generation, they can apparently achieve astounding results. Finally, it’s all a little too heartwarming and there are a couple of side narratives established to support the central characters’ back stories, but neither are engaging enough to warrant more than a mention here. Denzel Washington and Chris Pine do a decent job performing almost two-dimensional characters and Rosario Dawson deserves credit for remembering to act even in the moments where the film abandons tone. 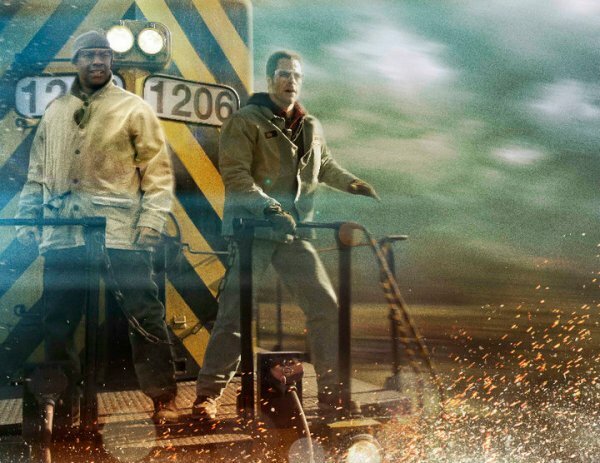 If you’re interested in trains, time or engineering this film will likely disappoint but, if you want to see a short, loud explosive journey with character depth and thematics as an optional sideline, then it absolutely reaches its planned destination. Unstoppable is released in Australian cinemas on Thursday January 6 through 20th Century Fox.